An ancient Ebon artefact, the Key of Delhyread, has been spectacularly stolen from one of Mort’s most prestigious museums, and everyone wants in. DarkNight, Krosstown Traffic, Third Eye News, Cloak Division and various other maniacs are all in the race. Retrieving it is going to be tough. 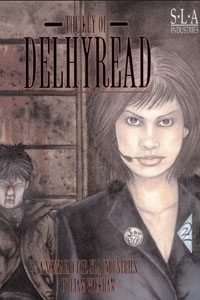 The Key of Delhyread is a frenetic scenario for the SLA Industries role-playing game. Although designed for starting characters, its fast-paced blend of intrigue, murder, investigation and media manipulation will challenge the ingenuity and courage of experienced players and newcomers alike. Full NPC bios and stat boxes, detailed descriptions of all important locations, extensive timelines, interesting new rules innovations and other goodies will give GMs everything they need to run the scenario smoothly, with the minimum of fuss and preparation. When the dust settles, the large cast of NPCs and extensive aftermath notes will provide you with a solid basis for an enduring campaign backdrop – if the characters survive, that is.